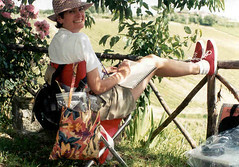 Reading to goats, and the summer of love..
A friend sent me a photo of her, reading to goats. 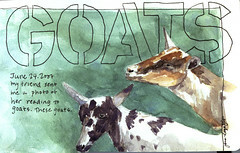 I painted the goats. Watercolor in my watercolor moleskine. On another topic, Husb and I had a wonderful evening out on Saturday night in Little Italy. 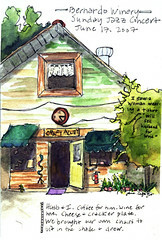 First we went to Sogno Di Vino, a lovely sidewalk cafe for wine and appetizers. Then, to the brand new dinner/jazz club named Anthology. Fabulous place!! Three floors, perfect acoustics, great service, waaaaay gorgeous and trendy. We sat on the 3rd level and had wine (!) and dessert while listening to a really good concert by Jesse Colin Young. Don't remember who he is? Well, he pointed out to the crowd that the 'summer of love' was FORTY years ago...Hmm, how come Jessie has aged so much and Husb and I haven't...Anyway GREAT evening and you gotta go check out Anthology. It's my new fave. Humphrey's is my other fave. This is the finished piece. I'm not sure how I present it, maybe it will become part of a larger artwork. It's about 6x9"
This page is a tad too sweet for me, so maybe I'll do an angst-filled page tomorrow. 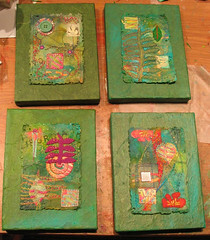 note: HSG says it's a "Calendrinia spectabilis"
I mounted those little quilts I made on rice paper covered canvases. They're ready to hang on the wall! 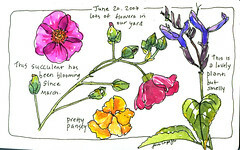 Each one 6x8" You know can click on the pic to enlarge it. In San Diego, different neighborhoods will often contract artists to paint the utility boxes. Here's my design. The boxes can be as big as 65" tall. I'll find out in July if I'm chosen. Shown here is the dark t-shirt in blue. Husb and I hung out for the regular sunday free jazz concert, sketched and watched people. Nice afternoon. 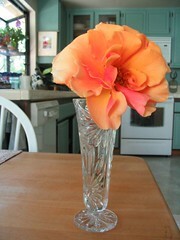 A rose from Husb's rose bush on our kitchen table. More from the Joggles online class I'm taking. 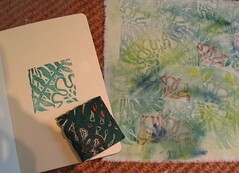 A hand-carved stamp, in my sketchbook, based on my own designs, then repeatedly stamped on fabric. Same stamp, on different hand done setacolor fabric. fruitstickers and nature doodles combined. color pencil in my moleskine sketchbook. 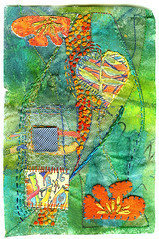 The working title of this small fabric piece is "Technique Extravaganza" because I used so many techniques! 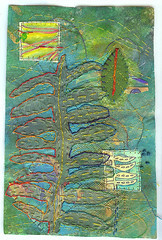 I'm working this up for the Art Quilt class I teach, to suggest uses of transfer techniques. Let's see if I can remember all I did to this piece! 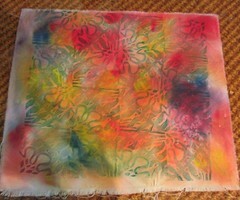 First, I dyed the fabric with SetaColor and did a sun print. 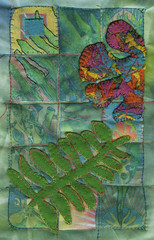 Then using an inkjet transparency, I made a photo transfer of one of my recent sketchbook pages. I machine stitched the grid. 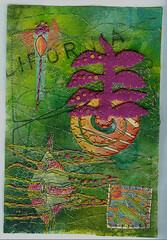 Then I pumped up the color on the transfer, by using color pencil on the fabric. 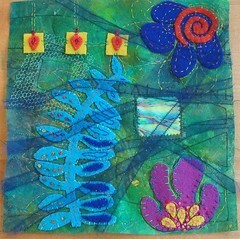 Then I appliquéd some felt pieces. The multicolor felt flower is made with water soluble Solvy stuff. And I'm not done yet! I've started stitching, as you can see. 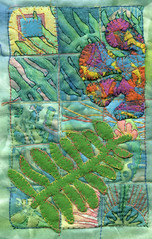 I'm liking the upper left hand corner, where I've begun outlining the fern in black thread. More from that 'personal symbols' online joggles class. You can see the inspiration from my earlier sketches. This is wool felt, and tulle, and a small transparency, on lutradur. More from the 'personal symbols' online Joggles class. Well, technically, yesterday. 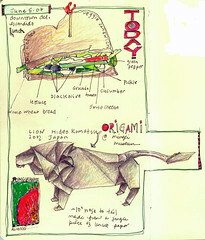 Lunch and a trip to the Mingei Museum to see some incredible origami. I have a new idol. Paul Madonna thanks to Martha. His new book, All Over Coffee, seen here is gorgeous and fascinating. I'm originally from the San Francisco bay area, so his work really speaks to me. I'd go so far as to say that he's our west coast version of Danny Gregory and Tommy Kane! Next week I start teaching my art-based, grant funded program for low income kids at Escondido Children's Museum. 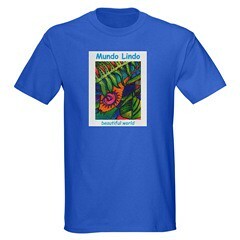 The name of my program is "Mundo Lindo ~ Beautiful World" and I just created this logo for it!! 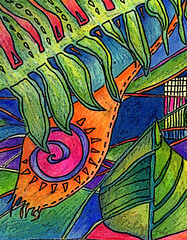 You may recognize this a part of one of my earlier drawings. - ooh, can't ya just see it on t-shirts! 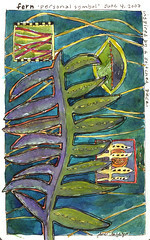 I used the design from the Fern fabric piece, and recreated it in watercolor (as Helen suggested!) It was a struggle. I think these designs work better using color pencil. 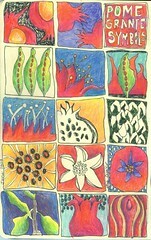 I combined the doodles from the "Personal Symbols"class exercise into a page. I wasn't thinking of Rousseau when I did it, but it remined me of his work when it was finished. Color pencil in my moleskine sketchbook. Buddy is all recovered from his surgery. Here he is, in motion, with BeBop. They're standing in our entry way, on the slate mosaic floor I created.